February is the end of summer vacation here in Brazil and I had a second opportunity to train public school teachers before the start of the school year. Once again God opened this door and solidified a partnership with this school so I’ve been invited back again in June. While I am not able to openly speak about Jesus Christ, I am able to use biblical principles to train these teachers. Besides that, the fact that I am able to return has meant I am starting to building relationships with these teachers who are a very dedicated bunch! At the beginning of March we started our new school year with new students and even a returning student from more than 10 years ago, before I had even met Paulo! During this time he has been away, Ismael has spent time in Switzerland as an evangelist, gotten married and is now serving as a missionary in Angola. 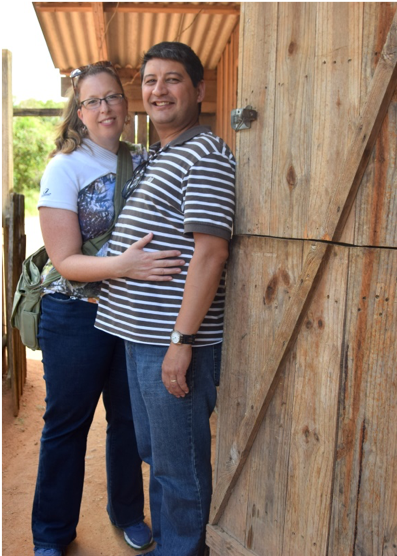 He and his wife are currently on a study leave as she works on a specialization in her area of study, social work, and as Ismael finished his Seminary education. It’s been great to have him back with us again. Thanks to technology, our new appointed missionary to Brazil, Brandon Jones, has started teaching already! He teaches Systematic Theology from either his home church or when he’s on the road visiting churches in the USA while I am in the classroom in Brazil acting as his interpreter. It has worked very well and the students are really enjoying his class. Every once in a while Brandon throws me one of these extremely difficult theological terms that I have no idea how to say in Portuguese, however, usually the students can help me or we plug it in to Google translator and see what comes out! The Seminary students, Paulo, and I are very excited for the arrival of the Jones family in Brazil. Our prayer is they will be able to be here by October. Since my last prayer letter, I have finished 2 months of physiotherapy with little improvement to my shoulder, so my rheumatologist has referred me to an orthopedic surgeon. He has ordered an MRI to see if I need surgery and more physiotherapy on not only my shoulder but also my upper back. He says the pain from the ruptured tendons in my shoulder is not related to my upper back pain, so hopefully the MRI will show if there is another problem in that area. For now, I continue to take medication and I do Pilates twice a week and physio 3 times a week which brings relief. Paulo and I are really looking forward to being at Triennial this July! We hope to see many of you there! We are also excited that the Joneses will be at Triennial, too!